You might notice that things have changed a little in the entry hall since our summer tour. We had a little round of musical furniture this past August. It all started with the new Farlov chairs that I picked up at Ikea. And by picked up, I mean managed to stuff into my mini van just by the skin of my teeth. Well, those new chairs in the living room meant the bookcases had to move. And moving the bookcases to the dining room meant the console table had to move. 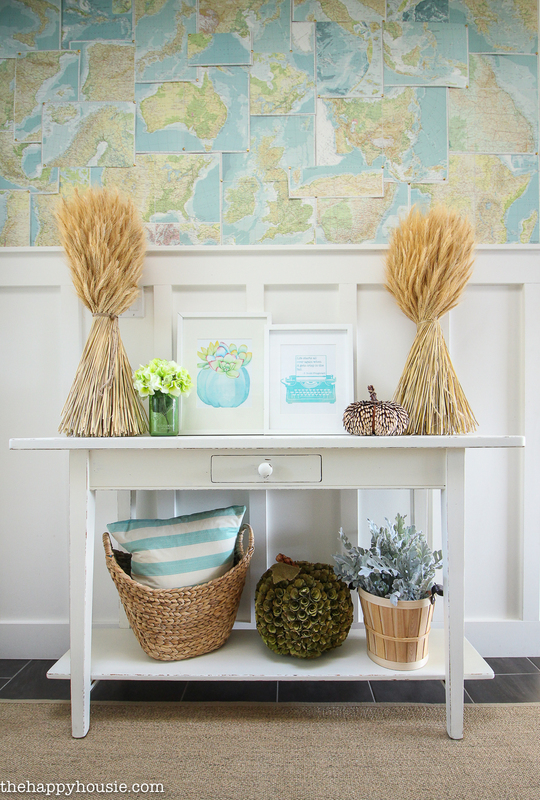 And moving the console table into the entry hall meant…. well, you get the idea. And, as much as I love this table, I’m not sure if I love it in this space. Plus, I miss it in the dining room. I may need to play a little bit of musical furniture again one of these days, but it will do the trick in the foyer for now. I’ll be sharing our dining room tour next week and I’d love your feedback about the new placement of our bookshelves in that space. 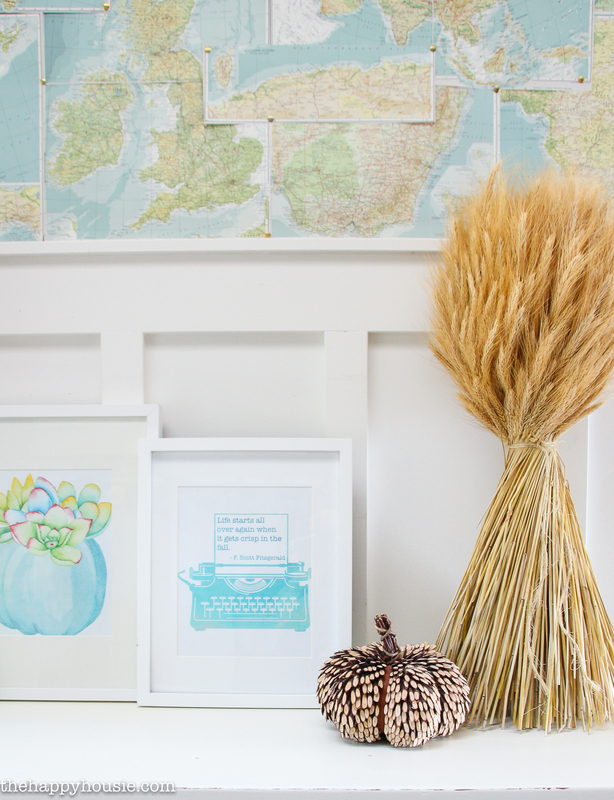 These printables are both available free – I shared them over the last couple of weeks – Download the pumpkin succulent print here and the vintage typewriter print here! 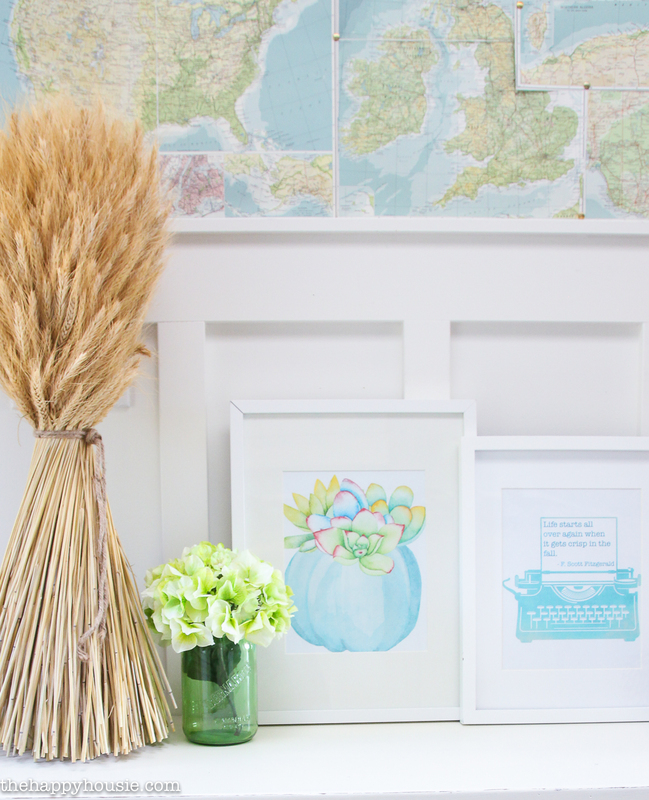 I spotted the wheat at HomeSense the last time I went and I just couldn’t pass it by. Plus it was a steal at $16 a head? sheath? what do you call it?? 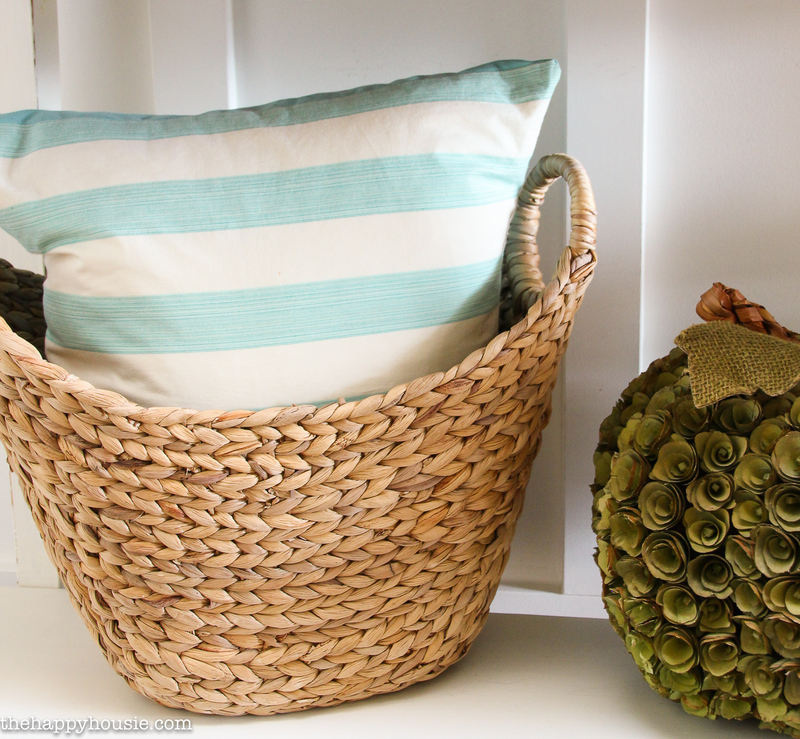 The green wood rosette covered pumpkin was also from HomeSense as was the basket (are you seeing a trend? 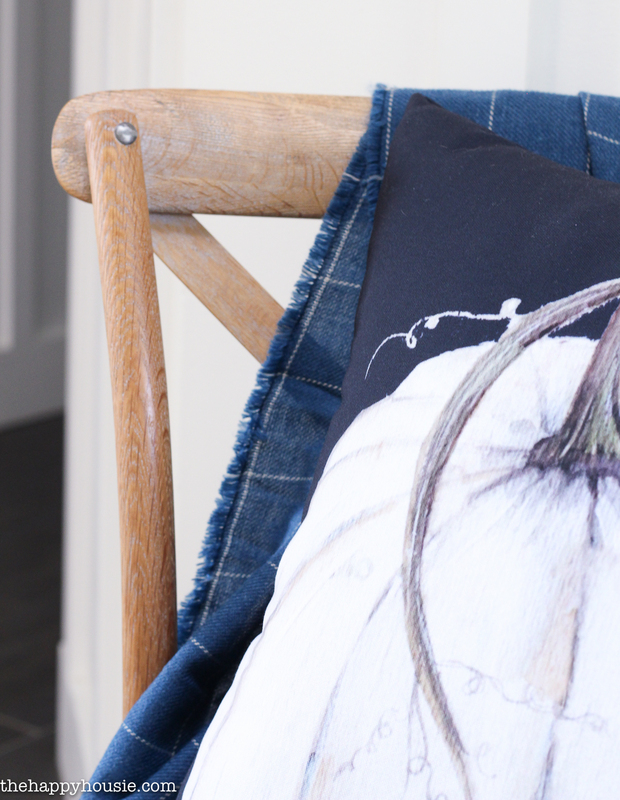 ), and I made the pillow with some fabric from Tonic Living. 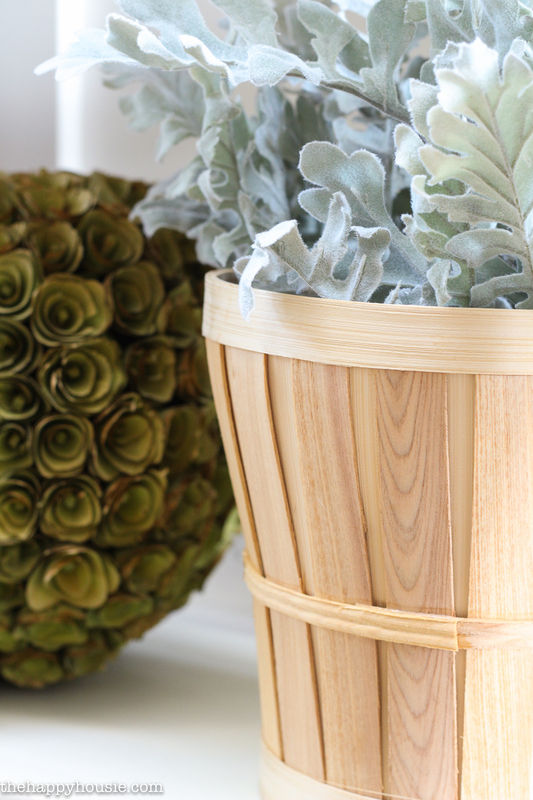 Michael’s for the win on the apple basket grey foliage (I think that’s Dusty Miller, am I right?). 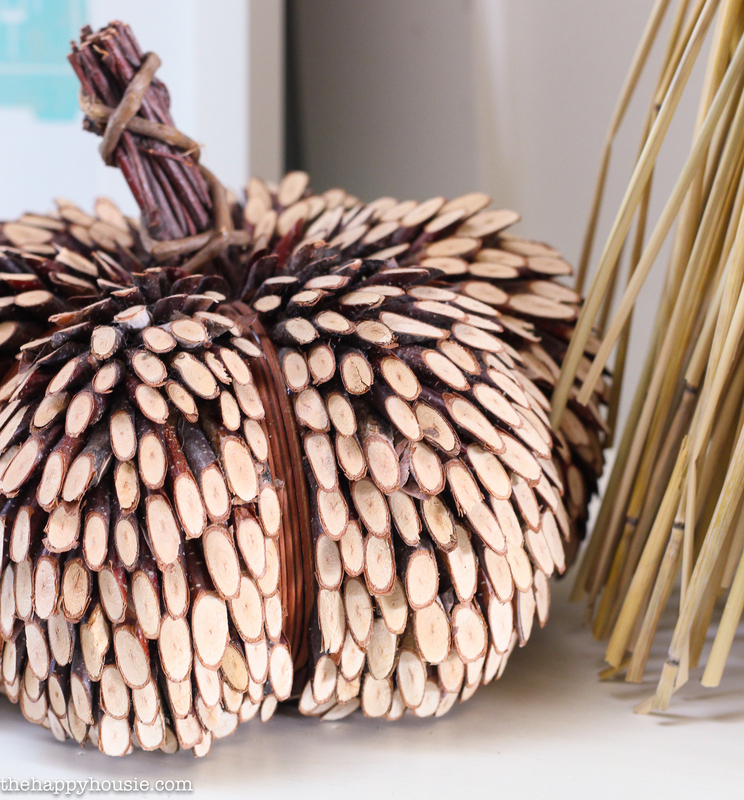 I thought about making a new sign for the other side of the entry hall… something fall themed or harvest-y feeling. But thinking about it was as far as I got. With heading back to school and teaching a new grade, this month has raced by, so I’m keeping things pretty simple for now. 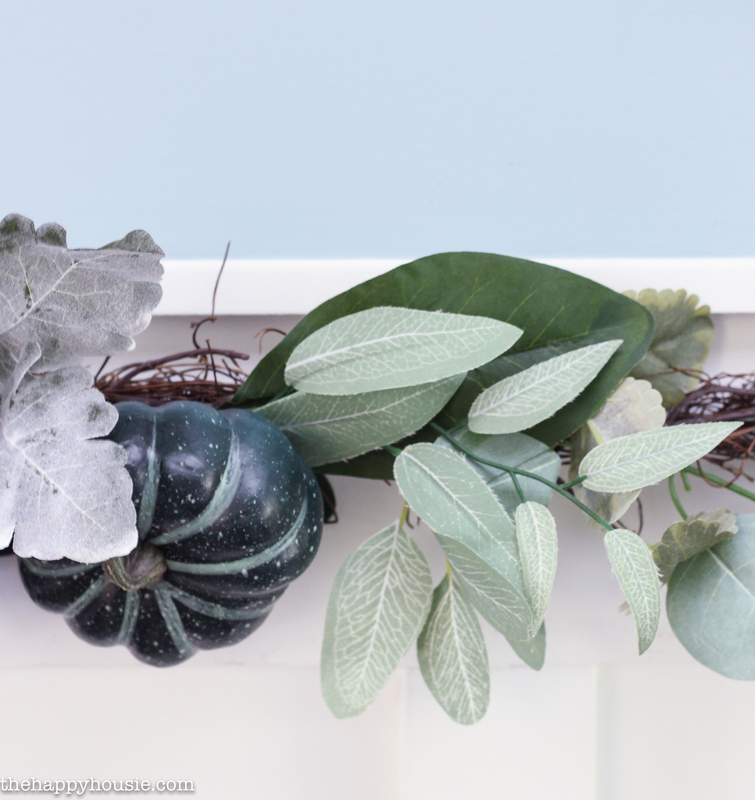 I threw up another garland like the one I used on our mantel, and called it Fall. 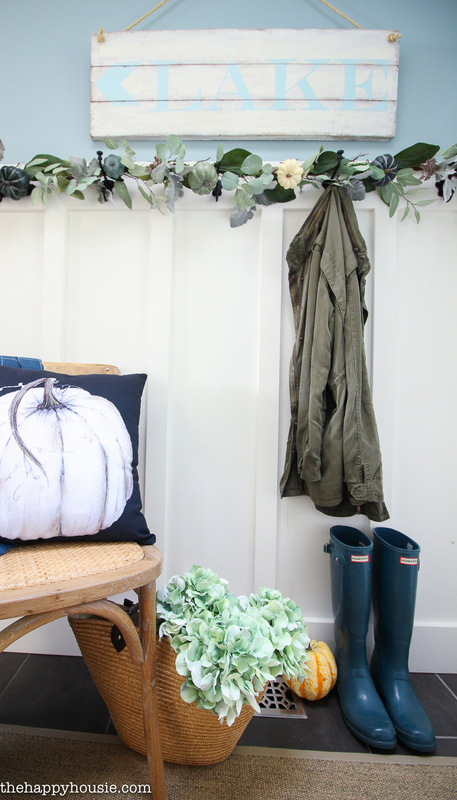 I did find a beautiful pumpkin pillow design by Lucy from Craftberry Bush and ordered it a few weeks ago when Society 6 had a 20% off and free worldwide shipping sale. The throw blanket is from Ikea – a steal at $5.99! Plus, it matches my boots. And trust me. These babies get a lot of wear around here. It is RAINY, to say the least. Wow! Everything looks so pretty! 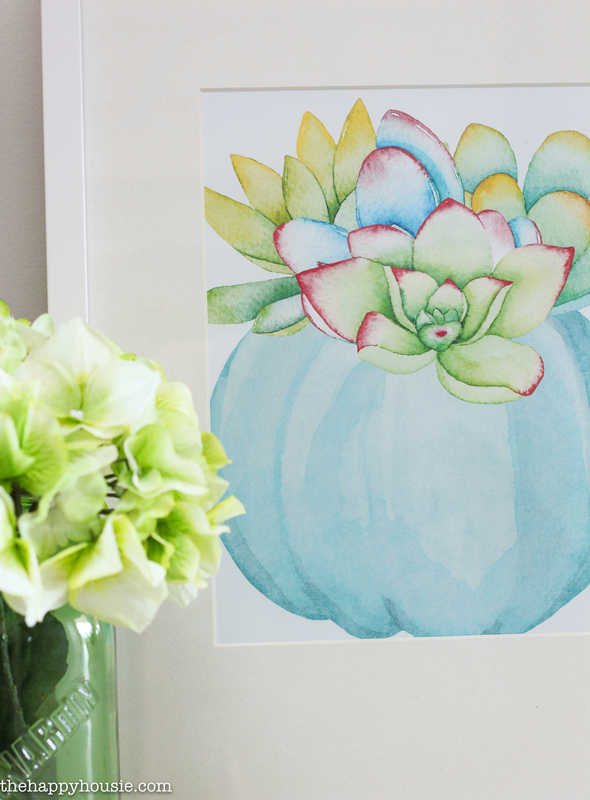 I love your pumpkin succulent print and the wooden pumpkin is amazing. I’ve been looking around for a while for a wooden pumpkin close to that. It gives a distinctive touch to the room décor. My favorite part of home décor is wall stickers. From nurseries to living rooms and dining areas, no room is off limits when it comes to trendy wall decals and stickers. I’ve bought some from Walltat. In love with their designs! Krista this is just so pretty! I love how you incorporate blue into your designs! It looks gorgeous. Love the pops of blue! So pretty! I always love your blues Krista and I think that table looks really cute there. Love that fall throw too! 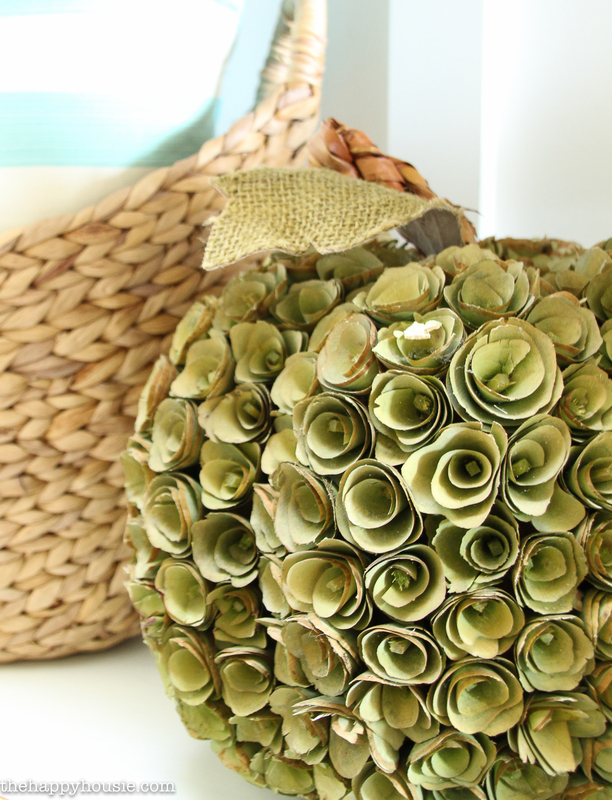 Your entryway is stunning!!! Love the pops of blue and those amazing maps! 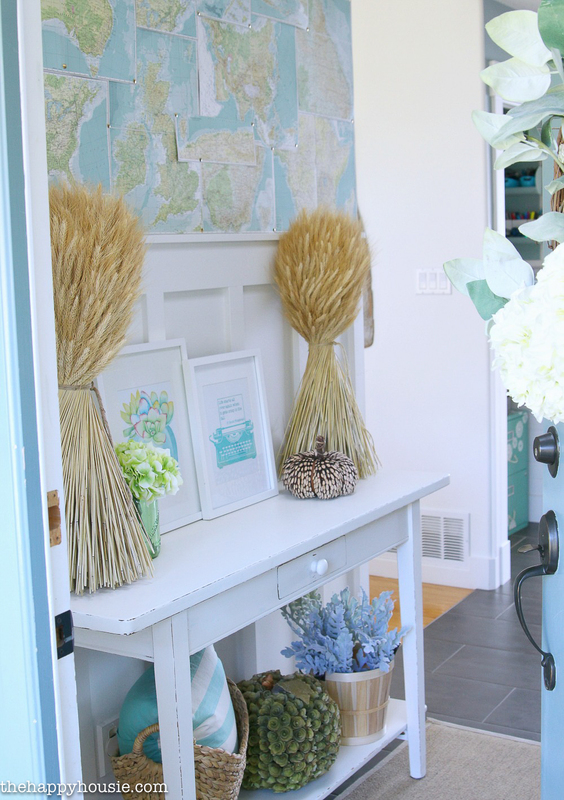 Loving this blue entryway scene! 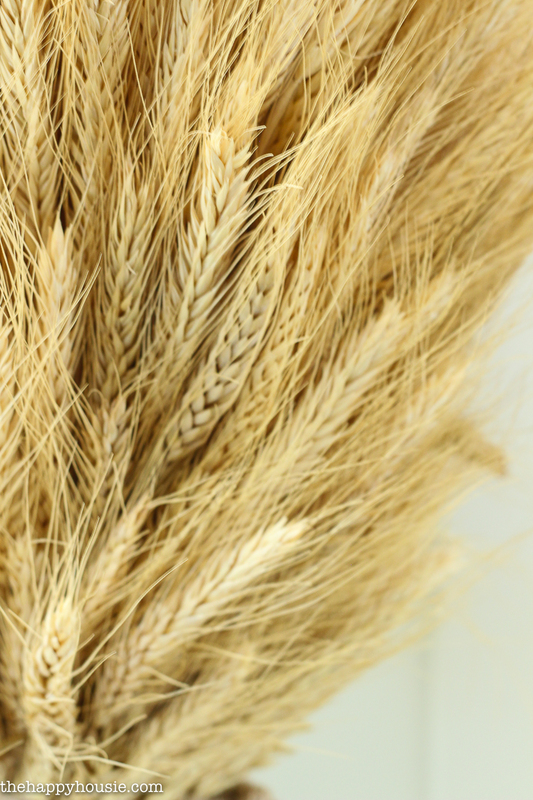 Those bushels of wheat are the perfect contrast in the space.